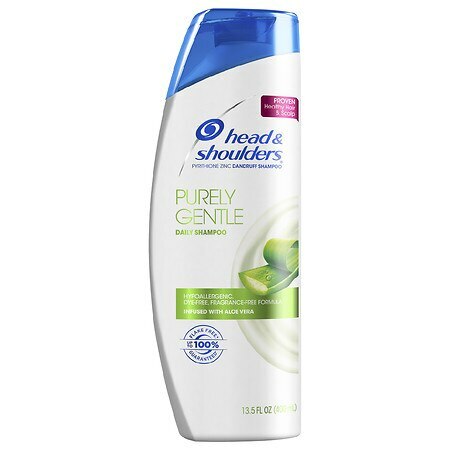 – Head & Shoulders Purely Gentle Scalp Care Shampoo, 14.2 fl oz Do you have a sensitive side? Get the shampoo that s right for you with Head Shoulders Purely Gentle Shampoo. – Head Shoulders Purely Gentle Shampoo soothes the scalp with aloe vera to help eliminate dandruff and leaves you with healthy-looking hair that s 100% flake free. * Dermatologist-tested, gentle shampoo with aloe vera that helps soothe a sensitive scalp. – It s clinically proven to be gentle on the scalp and strong on dandruff. – Hypoallergenic, dye-free formula leaves hair soft. – Dandruff shampoo and conditioner keeps hair clean, beautiful and 100% flake free*. – Gentle and pH balanced for everyday use, even on color or chemically treated hair. – Made in USA *visible flakes with regular use **associated with dandruff 7 Benefits: Fights dry scalp, calms itchy scalp**, relieves irritation**, reduces redness**, hypoallergenic, stops flaky scalp** and leaves hair looking beautiful.